This video above is a breathtaking view of the world’s largest artificial fountain called the Dubai Fountain at Downtown Dubai. I recorded this video during our (me and my friends’) 2010 visit to Dubai and had posted this video on my Facebook timeline and my own YouTube channel bz bee. The Dubai Fountain is the world’s largest choreographed fountain system on the Burj Khalifa Lake. This is the world’s largest artificial dancing fountain which is 25% larger than the Bellagio Fountain in Las Vegas. During our 2010 visit to Dubai, the Dubai Fountain used to run from 6 pm to 11 pm in every 30 minutes. Each performance of the dancing fountain used to be about 5-7 minutes. The fountain is illuminated by 6,600 lights and 25 colored projectors, with 1,000 different water combinations. It is 275 m (902 ft) long and shoots water up to 500 ft (152.4 m) into the air accompanied by a range of classical to contemporary Arabic and world music. 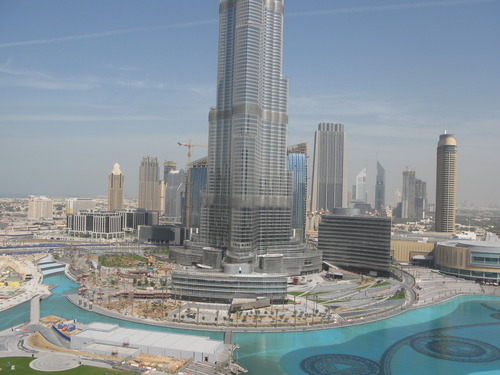 It was built at a cost of AED 800 million (USD $218 million). The Dubai Fountain consists of many high-pressure water jets and shooters. 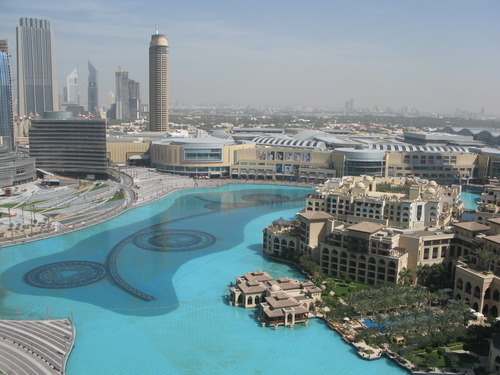 At any point in time, the Dubai Fountain can spray 22,000 gallons (83,000 liters) of water in the air. This picture above is a picture that I had clicked of the fountain during daytime in 2010 when it was not running. This photo was clicked from my friend Samira and Tanveer’s The Residences apartment balcony, 23rd floor. This balcony had a view of Dubai Mall and the Burj Khalifa Lake. This picture above is also from the apartment’s balcony. I had clicked this photo while the fountain was not running during the daytime. This balcony had a view of the Burj Khalifa and the adjacent lake of the Dubai Fountain. I am so grateful to my friends Samira and Tanu (Tanveer) for hosting our stay in this magnificent place at their The Residences Apartment. This beautiful place was too good to be true with all the wonderful opulence of Dubai and all the amenities one could ask for, especially with the spectacular shows that could be enjoyed from their balcony every single day we friends had stayed at their world-class apartment! Please enjoy the video link from I posted to my YouTube channel from my Facebook that I had posted once I was back from my Dubai trip back in 2010.